Joseph Tobianski | The Flint JournalCarlot Dorve of Haiti plays the trumpet in the music room at the St. Paul’s Episcopal Church on Tuesday afternoon in Flint. Dorve lost his right arm when he was 5 years old and started to play the trumpet when he was 12. FLINT, Michigan — Near scattered stacks of sheet music in a downtown church basement, Carlot Dorvé closes his eyes, gliding his fingers across the trumpet he brought from Haiti to play a soft, velvety melody. It’s a long way since the days in his home country when the Haitian trumpeter was told he could never be a musician. They told him he needed both of his hands to play. But the amputee didn’t listen. Losing his right arm as a child to an infection in Haiti meant the right-handed Dorvé had to work even harder to prove his dream to perform music was possible. Now, he’s living that dream in Flint. In the year since arriving in the city as a guest musician at Mott Community College, Dorvé has become a local sensation, known for several performances in college and church concerts around the community and state. His name even reached Michigan State University where an audition landed Dorvé a spot in the college of music for fall and where connections have led to the opportunity to soon receive a donated prosthetic arm. “I got an anonymous phone call from a woman who just said ‘I have a trumpet player you need to hear,’” said MSU trumpet professor Richard Illman who has since performed duets with Dorvé . A scholarship and sponsorship at MSU will cover Dorvé’s tuition but he is working on raising money for his room and board and still needs to renew his visa. Ron Junttonen, of Prosthetic Center Inc. in Lansing, has also agreed to donate a prosthetic arm. Dorvé was just five years old when he slipped on a plantain tree in the Haitian countryside and broke his right arm. His grandmother took him to a healer but within two weeks, his arm darkened from an infection that threatened to spread. 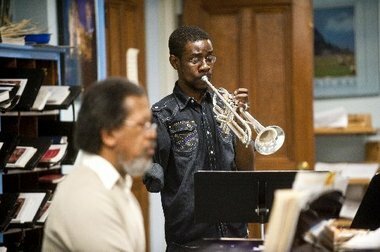 Joseph Tobianski | The Flint JournalCarlot Dorve of Haiti plays the trumpet in the music room at the St. Paul’s Episcopal Church along with the church’s music director and Edward Arter. The two plan to play together in upcoming church concerts on the east coast. “My mother didn’t want to (have the arm amputated) but the doctors said an amputation was the only way to save my life,” said Dorvé, who grew up in a two-room home in destitute Port-au-Prince with five siblings and was mostly raised by a single mother. It meant re-learning how to write his name, playing sports and even dressing himself with only his left hand. But the worst struggle came at the special needs school Dorvé attended. Teachers wouldn’t let him do the one thing he wanted to do most: play an instrument. “With music, you could call it love at first sight,” Dorvé said at his rented Flint home whose shelves and tables are covered with the music of such inspirations as Beethoven, Mozart and Louis Armstrong and where a CD player blared classical Haydn symphonies. He kept begging teachers to let him participate in music classes. He used the scarce food money he had to collect music tapes from street vendors, not knowing when he’d even get to a tape player to listen to them. Dorvé was soon seduced by the brassy Soprano instrument that starred in Carnival of Venice: Fantasie, Theme and Variations by Jean-Baptiste Arban. “That piece marked my life. Something about the trumpet, I just loved it,” he said. He finally convinced teachers to let him try an instrument. By age 13, he had taught himself how to hold the trumpet with only his pinkie and thumb while his three middle fingers played the valves. He practiced everyday until he was the best in his class, earning him a scholarship to high school and ultimately a place in Haiti’s largest orchestra. He played in the Philharmonic orchestra of Saint Trinity, at the Holy Trinity School of Music where he also taught music. Dorvé, who also dabbled in piano, said he didn’t plan to leave Haiti but was picked along with four other Haitian music teachers for the four-month MCC program. The decision to stay in Michigan wasn’t easy. His heart still aches for his home that was struck by unimaginable tragedy just days after he left. Minutes after MCC held a welcome reception for the Haitian musicians Jan. 12, 2010, a shattering 7.0 magnitude earthquake ravaged their tiny Caribbean island. It killed two of their students and crushed the music school that had become a small treasure in the poverty-stricken nation to rubble. It was a devastating couple of days trying to reach loved ones. “I couldn’t play. I couldn’t even eat. I just cried,” remembered Dorvé, who scoured the Internet and Facebook for news everyday, grief-stricken by the heartbreaking images and sorrow that had swallowed the already beleaguered nation. But eventually, music provided a way to heal again. With the fate of their music careers uncertain in Haiti, Dorvé and a couple of the other musicians chose to extend their stays in the states. Flint resident and church patron Paul Adams still remembers spotting Dorvé for the first time at Calvary United Baptist Church in Flint. No one had ever seen Dorvé before. But throughout the service, from a back row pew, the musician suddenly began playing his trumpet along to hymns. “He just came to church and started playing in the back of the congregation. Nobody knew where this beautiful sound was coming from,” Adams said with a laugh. Adams, who plays trombone, said Dorvé has captivated many local hearts. 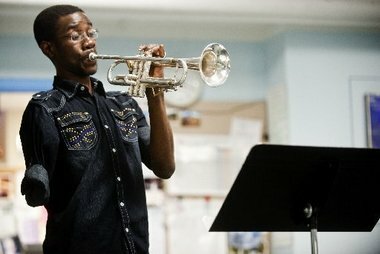 Local connections led Dorvé to New York last year where he spent a month studying music with national trumpet master Wilmer Wise of the International Trumpet Guild and got the chance to play for jazz great Wynton Marsalis. Dorvé, an avid Christian, is also scheduled to perform in several upcoming church concerts on the east coast with Edward Arter, who is St. Paul’s Episcopal Church music director in Flint.